Kansas revenue forecasters just lowered expectations for tax revenue In FY 2016 and FY 2017 by $348 million, putting the budgets for those two years deeply in the red. Make no mistake. The problem directly results from steep income tax cuts enacted in 2012 and 2013. Note the chart below. In FY 2013, general fund tax revenue reached a high of $6.333 billion, and then fell to $5.632 billion in FY 2014 after the income tax cuts were fully implemented. Tax revenue stayed at that low level in FY 2015, growing only a scant $85 million. The revised revenue estimate now predicts tax receipts will grow to $5.865 billion in FY 2016 and to $6.039 billion in FY 2017. But remember, that growth only occurs as result of tax increases, passed in the last legislative session, that were supposed to be worth more than $375 million each year. Again, tax revenue fell sharply in FY 2014, and has never come close to recovering, even after lawmakers imposed the biggest tax increase in Kansas history. Yes, current economic conditions have some effect on revenue collections, but it’s the 2012 and 2013 income tax cuts that have brought down the state budget. Let’s plug in the new revenue estimate to analyze the effect on FY 2016 general fund finances. The result: With just over 2 months left, the FY 2016 budget is now $137 million underwater. That deficit occurs after a $17 million cut to universities in March, after numerous other program cuts, after freezing school funding in a block grant, and after transferring $280 million from other funds. And that’s after raising the sales tax to the point where Kansas has the highest sales tax on food in the nation. Now look at FY 2017. Same story. Assuming the governor and legislators somehow erase the FY 2016 deficit, FY 2017 will open on July 1 with a beginning balance of zero, but estimated revenue does not nearly pay for the scrunched-up expenditures approved for FY 2017, leaving an ending balance $174 million below zero. Between now and the end of June 2017, lawmakers will have to somehow adjust the budget by more than $300 million, not so that Kansas can flourish, but so that Kansas can just barely scrape by with no money in the bank. This situation will keep repeating itself and continue to drag Kansas down, until lawmakers go to the source of the problem and correct it. General fund tax collections have failed to meet the mark every month but one in FY 2016. Each instance has triggered expressions of anguish, frustration, and despair, because every miss means something negative—more money transferred away from children, cuts to higher education, lost hope for public schools, or crumbling roads. 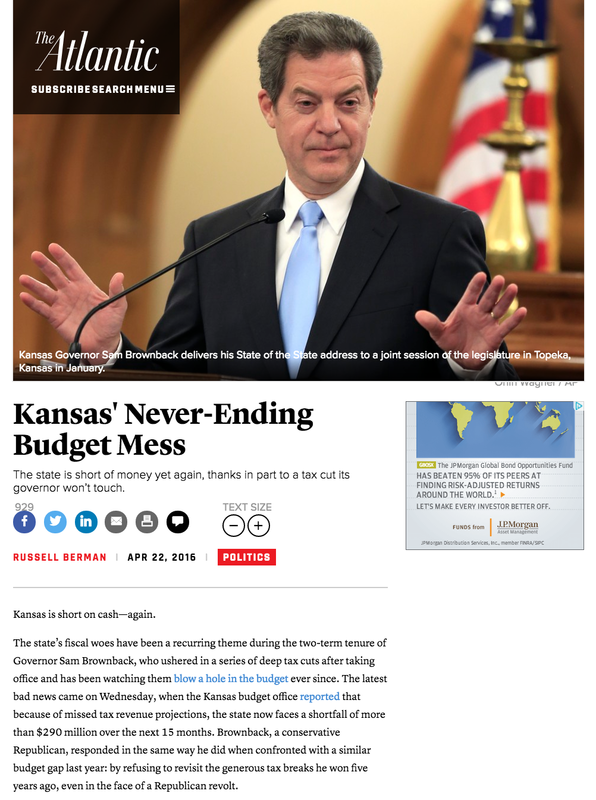 Kansas finances have become a high wire act with no net. Lawmakers have an empty bank account and limited options when revenue collections underperform. The financial hole stemming from the 2012 income tax cuts is so deep that even two sales tax rate hikes did not balance the budget. The revenue estimating misses in FY 2016 follow a rocky record in FY 2014 and FY 2015, mostly a result of inaccurate forecasts of income tax receipts. In FY 2014, the consensus estimate at one point predicted income tax receipts would reach $2.525 billion, but when the fiscal year ended, collections only totaled $2.218 billion—a $307 million miss. In FY 2015, estimators again predicted income tax receipts would hit $2.525 billion, but the actual amount turned out to be $2.277 billion—a $248 million miss. The same pattern may be taking place in FY 2016. The current estimate predicts $2.450 billion, but through March the state has fallen behind last year’s pace. Granted, establishing an accurate and predictable revenue trend does not come easily when tax policy changes dramatically, or goes where no state has gone before. But the excuses being offered for the recent estimating misses don’t add up. The weakening Kansas economy is not a surprise. Lately, the governor has tried to blame the estimating process itself, intimating that some different method would work better. Don’t buy it. The Consensus Revenue Estimate (CRE) is a consensus between the State Budget Director (on behalf of the governor) and the Director of Legislative Research (on behalf of the legislature). The two directors and their staffs receive economic data and advice from 3 consulting economists, and they rely on tax data and advice from the Secretary of Revenue. Nothing gets into the CRE without agreement from the governor’s budget director. Everything in the CRE is based on tax information brought by the Secretary of Revenue. The governor is not a victim of some broken process. Key people in his administration are in charge of it. The governor’s budget director and revenue secretary have been architects and supporters of the governor’s tax plan. They wanted a different revenue outcome from the one we have, maybe even truly believed in a different outcome, and perhaps that is why they have had so much trouble getting the CRE low enough. Sinking tax collections continue to put the lie to the original promises. 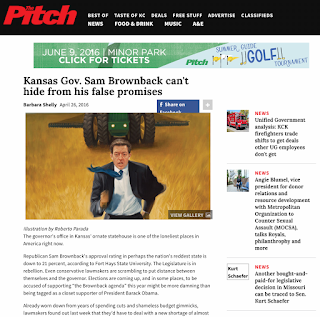 Huge income tax cuts, benefitting mainly the wealthy, have not brought economic prosperity to Kansas. Rather, those unprecedented tax cuts have wrecked the state budget. 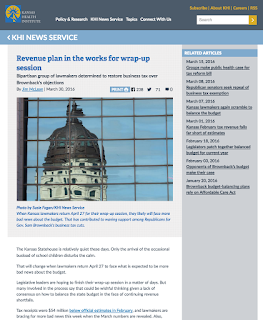 Kansas does not need a change in the process of estimating revenue. What our state does need is for the key players to provide a hardheaded assessment of what really is going to happen, not what they hope will happen. When Republican Asa Hutchinson became the new governor of Arkansas in 2015, he sought to continue the state’s expansion that had been previously put in place. Explaining why, he argued that turning away federal dollars that more than 30 other states were receiving would punish Arkansas. "It is perfectly consistent, it is perfectly conservative and logical to oppose Obamacare as a federal policy and yet accept federal dollars under the Medicaid program in Arkansas." Most Kansas citizens have arrived at that same conclusion. Whatever Kansans may think of Obamacare, independent surveys by the Docking Institute and by the Kansas Hospital Association both show wide approval of expanding Medicaid eligibility. — This column originally ran in a variety of Kansas newspapers last weekend. A version also aired on Kansas Public Radio affiliates, which you can listen to here.